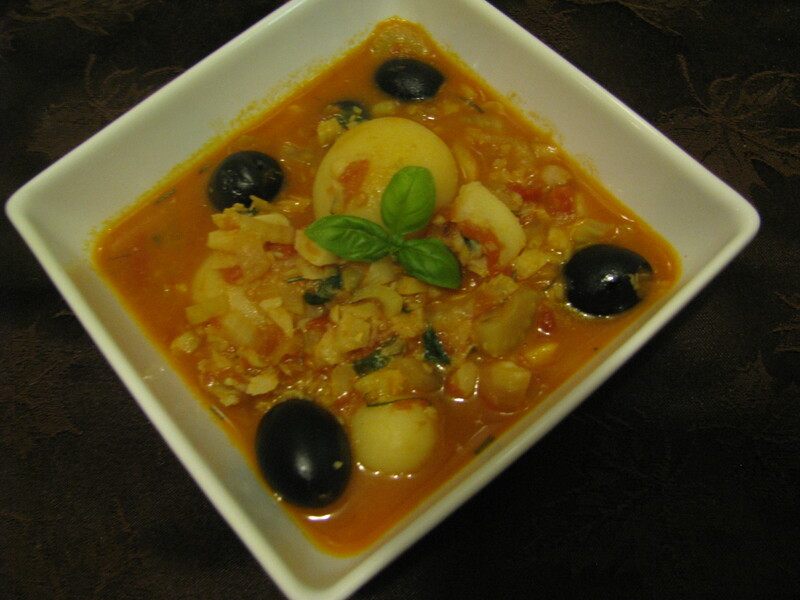 This cod-fish stew is light and amazing in flavors. I added some baby potatoes, black olives, fresh tomato, chicken stock, onions, garlic and fresh basil. The flavors burst in your mouth with every bite. One thing I forgot to add to this dish was was a slice of a baguette of bread to use for the dipping at the end. This is a great dish for the summer; especially on those rainy days. ENJOY!! Rainy days in summer! Wow, that would be something!! That looks amazing! On my to-do list! Thank you. 🙂 Let me know how it turns out if you try it. My family loved it. I’ve never tasted cod. Is it a “fishy” fish? Just the thing for me to try to get out of our baked cod rut. Thanks! Thanks! It looks like it’s a “wing it” recipe. I don’t see any quantities for ingredients, so I will just play with it a little. I can’t see much of a chance of ruining it. It does sound flavorful! That’s exciting! Good luck with your project. Beautiful – we eat a lot of cod (salt cod) here in Andalucia!